When transporting a large number of passengers, be it in a coach or a bus, it is only responsible to have a rudimentary first aid kit to hand. The Motokit Large Vehicle First Aid Kit in Copenhagen Zip Bag provides you with peace of mind that any accident will be attended to quickly and efficiently. We come into contact with motor vehicles every single day, so making sure that your car, taxi or van is equipped with the best materials when faced with an accident is critically important. 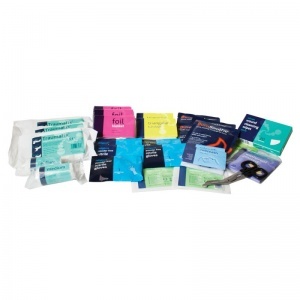 This new standard of kit has been developed by professionals to ensure that even the health and safety novice can provide basic first aid treatment. What Does the Large Copenhagen Bag Contain? The kit comes in a bag that features individual netting compartments, easy grip handles, zipper pulls and elastic loops. The soft rip-stop fabric is designed to keep dust and moisture away from the materials inside, and is tough enough to endure any knocks and rigours. 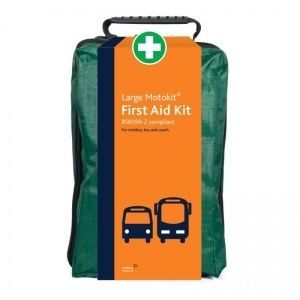 The Motokit Large Vehicle First Aid Kit in Copenhagen Zip Bag is usually dispatched via First Class Royal Mail and delivery should be within 1 to 3 working days.